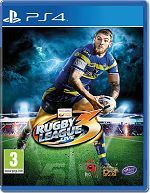 The most anticipated Rugby League video game to date Rugby League Live 3 includes the following features and more! Improved Career mode and "Be A Pro" - take a Forward or a Back through the ranks of a U20 team into a full professional squad Vastly improved Instant Replay System including super slow-mo and user defined camera placement - get right into the action! Enhanced online play including filtering by locality and Online Tournaments. Rules - Latest rule updates including Auckland 9's. Teams - Over 100 teams from Rugby League competitions around the world including the NRL, Super League, Holden Cup, and many more. Career Mode - Infinite career mode, play as a rookie, coach or jump in and play as a recognised star player. Instant Replay System - New feature which includes super slow-motion and user defined camera placement - gets you right into the action! Tackling - Dynamic tackling system that now includes the ability for drag and drive tackles. Online - Enhanced online play, features up to 16 player online tournament. Lighting - Totally dynamic time of day lighting with full sun movement and weather system. Experience System - Earn experience both on and offline to rise to the top of the leaderboards. Fan-Hub Player Sharing - Create your own players and teams and share them online across all supported platforms.